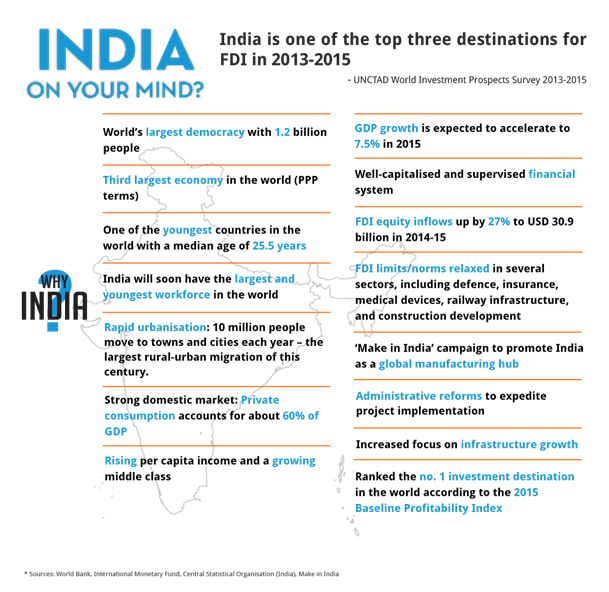 India has become an increasingly attractive destination for doing business. Foreign direct investment has been on the rise with a growing number of international businesses looking at establishing operations here. However, the risks associated with venturing into a new territory with a complex accounting, tax and regulatory environment are many. A multitude of languages and vast cultural differences within the country itself add to the difficulties and costs of doing business in India. Whether you are looking to expand your existing operations in the country or planning to set up in India, we provide a one-stop solution and handhold investors through the intricacies of the process. Besides our competence in accounting and tax, our strength lies in the ability to be your business and commercial adviser and managing your entire entry plan for India as a comprehensive project. We work with you right from the conceptualisation phase to being your implementation partner in greenfield business set-ups, acquisitions and joint ventures. We can assist you with all that needs to be done while entering India right from liaising with a market research firm, pre-investment advisory on available opportunities, validating your business plan, selecting the correct form of entity, providing regulatory and tax advisory, scouting for a location and acquiring land, hiring the right people to getting you in touch with the right vendors and monitoring them. Once your business is set up, we can even take care of your book-keeping, payroll, management reporting, company secretarial and compliance requirements. With years of experience in India, we can add value to your expansion plan by looking after these functions while you focus on your business. Based on your company size, your needs may differ – we customise our services to your requirements. We can help you at any stage of your entry plan. As your partner, we will be responsible for your tasks just like a trustee. We will share our local knowledge with you and design a package of services that is relevant specifically to your business. Our experience and practical and commercial understanding of India equip us to help you successfully establish operations in India. Through our services, we provide your business with tremendous support and care. We are here to think for you and act for you. Just when you think India is due for a market correction, the dynamic duo of prime ministerNarendraModi and central banker RaghuramRajan prove you wrong. A surprising rate cut this week helped lift the Wisdom Tree India (EPI) exchange traded fund by 0.6% over the last five days, beating out the MSCI Emerging Markets and S&P 500 indices. “Reformers will be the performers,” says GauravMallik, managing director of emerging markets for State Street Global Advisors, a $2.4 trillion wealth management firm in Boston. “This is why all eyes are on India right now. Today, value in emerging markets is locked up in resources, energy and materials. But the only way to unlock that value is you need to reform the business. India is doing that,” he says. Emerging Global Advisors, a New York-based ETF company, agrees. They touted reforms as the No. 1 for buying Indian equities. In this case, reforms means tax changes and rules changes that allow for greater absorption of foreign money into Indian companies. On balance, Saturday’s 2015-16 fiscal budget pleased investors despite a marginal sell-off of 0.5% in the stock market. Indian equities are not overbought yet. The relative strength indicator is still in the 50s. An RSI of 70 is a sell signal for technical traders. ADVERTISING Not overbought yet. 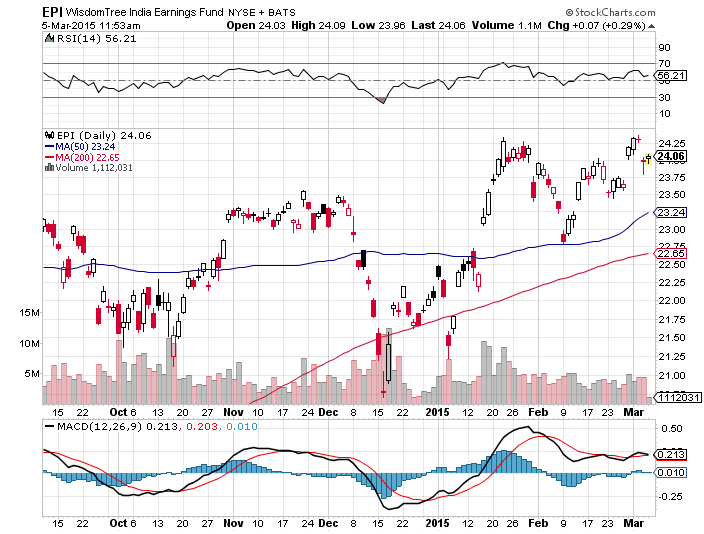 The Wisdom Tree India ETF is trading above its moving averages but volume remains low. The Relative Strength Index, a measure of whether or not a security is overbought or oversold, indicates the Wisdom Tree India fund is safe from technical sell-offs for now. Emerging Global Advisors lays it out this way in a recent presentation to clients. India is expected to have the fastest GDP growth rate in emerging markets and will beat China by 2016 if it grows over 7.5% next year. The governmentiscounting on 8%. “You have to be in India,” says Peter Kohli, CEO of DMS Funds, an emerging markets specialty firm in Leesport, Pa. “It’s a bull market for the next five years,” he told me over a sushi lunch at Koi in New York recently. It’s not too late to buy India. Fund managers like Kohli recommend buying on pull-backs in the market. Current forward valuation levels point to sustainable growth at a reasonable price over the long term, Emerging Global says. “Modi knows where and how he wants to get from point A to point B and he’ll do it,” says Vladimir Signorelli, president of boutique research investment firm Bretton Woods Research in Long Valley, NJ. BWR released their monthly index rankings for 46 countries. India ranked at No. 10. It is second only to China as a top two emerging markets for investors for the month ahead. China was ranked No. 7. E.U. countries, the U.S. and Japan all finished out the top 10.